The Large Hadron Collider: Huh? Don’t let the high falutin’ physicists kid you. 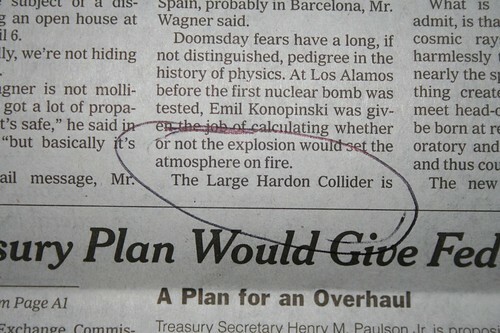 The real job of the Large Hadron Collider is to make a large number of people (including me) feel especially stupid. Mission accomplished. Good job, professor. The LHC is supposed to reveal the secrets of the universe, but when it finds them, how are we going to know? The people who are in charge of this thing are smart, too smart for mere mortals, and they speak a different language. Paolo Gondolo, an associate professor of physics at the U., looks forward to the research on “super symmetry” – a theory that each particle has a superpartner, which could lead to a better understanding of dark matter, which pervades the universe and is still a mystery to physicists. Mystery? You want mystery? Here’s a mystery: What are you talking about? The article, like many others this week, was actually about fears that the giant “atom smasher” would instead destroy the earth. Why are those fears getting so much attention? Because we great unwashed can understand the concept of the end of the earth (Psst: It’s when Tom Brady gets injured) more than the Higgs Boson particle, which — as you know — is the subatomic particle responsible for the existence of mass. Wired Magazine, which usually prints in English, gave it a go in laying out the best- and worst-case scenarios. And the magazine did well, right up to a point — the first paragraph. Best Case: Scientists detect certain types of supersymmetric particles, aka sparticles, which physicist Michio Kaku calls, “signals from the 11th dimension.” This would show that string theorists have been on the right path and that the universe really is made up of the four dimensions we experience and then seven others that unite the forces of nature. MPR’s Midmorning this morning, presented three scientists — Roger Rusack, a professor of physics at the University of Minnesota; Joseph Kapusta, a professor of physics at the University of Minnesota; and Joe Lykken, a particle physicist at Fermilab — trying to cut through the science jargon. “Where are they? How are they hidden and why haven’t we found them yet?” he asked. The mind fairly boggles at the possibility of life in that dimension. Maybe it’s where the Twins have a decent bullpen. Or where a pig with lipstick turns into a giraffe. It’s no surprise, really, that one of the most popular YouTube videos this week is the one that attempts to explain these concepts the old fashioned way — in a manner people like me can understand. Another lesson learned from the LHC? We need Schoolhouse Rock now more than ever… with or without its superparticle partner. Update 11:36 a.m. – Hackers inflitrate LHC, according to telegraph.co.uk. Does this mean hackers are smarter than physicists? Hey, at least people are getting the name right and not flubbing it like the NY Times. This is one of the reasons I think there is a need for general science and math courses in High School and College, where the teacher can talk about interesting things in Math and Science (like the Higgs Boson, dimmensions greater than 3, or how to take off your pants and put them back on again with your legs tied together). We obviously need Algebra and Physics classes too, but I think it is more important to give students a reason to want to learn them first. What a read. Where to begin? 1) I had no idea Sparticus was a signal from the 11th dimension. 2) You wonder what kind of people go into that profession when for a whole generation of them, “back to the drawing board” is a worse scenario than the end of the world. 3) If you’ve never seen the Pixar film Cars, then this won’t mean anything. But when I was reading your “mystery” sarcasti-rant, I heard Chick Hicks voice in my head doing his “you want thunder?” spiele. More seriously, the Wired thing posted is simply [heh] the application of the scientific method. While the theory may be hopelessly opaque, it does provide expectations of what might happen under certain circumstances. When those circumstances are provided by the LHC, either they’ll be met or they won’t. I am reminded of Einstein’s relativity. It seems incomprehensibly ridiculous (space is curved. ORLY? Show me where so I can make sure I always play golf going the other way). But a consequence of it would be that the orbital mechanics of Kepler, Newton etc aren’t exactly correct. Decades after this, someone did the math and said that the orbit of Mercury would be off the standard calculations by this particular smidgen. They then stuck their telescopes at it and found out, it was indeed. But yeah, that stuff is, well, dense. Your reference to a pig with lipstick is more apt than I think you intended it to be: it is hard to reach the masses with it. No matter how hard one tries to make it accessable, it still is…dense. For the sake of other readers here, there is a book called Flatland, describing a fictional place which is only two dimensonal. I read a chapter of it some time ago, as well as a good deal of commentary about it. It does present simple real life situations which work totally differently (e/g/, a house with more than one window/door cannot be structurally stable). But the ingenuity of some of the applications give one a decent feel for what it’s like having another dimension “out there’, but without any empirical access to it. How could I have forgotten to second the plug for Schoolhouse Rock? Now that would be a good watch. >>there actually IS a place where lipstick turns a pig into a giraffe? I think what most of us think if as “another dimension” is different from what Dr. Lykken means. I don’t think he is talking about the possibility of other universes(such as in science fiction) where pigs turn into giraffes (although I believe that is a possibility, “alternate universe” would just be a better term). I would also recomend “Flatland” for a great discussion of this. Another book that is suprisingly on the subject is “Slaughterhouse Five.” It really helped me understand the fourth dimension (time). I suppose there could be a higher dimension being that looks like a pig in three dimensions, but when you put lipstick on it it “moves” and then looks like a giraffe in three dimensions. The mice in “The Hitchhikers Guide” are like this. Ah that’s right. Now that it’s mentioned, I remember “A Wrinkle in Time”, with the titular lesson using the hem of an old lady’s skirt. Tom Brady being injured will not end the earth. If you took Brady’s credentials when he became the quarterback in New England they would read almost the same as the guy who is replacing Brady. Backup quarterback in college, never was a starter and was a late round draft choice. Least we forget that Brady replaced Drew Bledsoe who was considered the best quarterback of his time. If Matt Cassel does a good job maybe the Vikings will get Brady from New England since they missed out on Farve. BTW, BigAlMN, I think you’ve slipped in from another dimension. At no time was Drew Bledsoe considered the “best quarterback of his time”. That must be some bizarro universe that you live in. Bob, I am curious about why the snark you usually reserve for people who flush their ties down toilets is being vented on the most important (and interesting) piece of pure science news in, as others have pointed out, a century. The string theorists and others are getting their blue books graded and a whole lot more than a pass/fail will result. My IQ is 148 by the way, and I don’t know much about it either, because I’m not a nuclear physicist – but I still find it fascinating. My son wrote an honors paper in college on a tiny tiny calculation he had discovered that made a larger math calculation having to do with string theory just a few lines quicker. When he explained it I did not sneer and ask him how the college football team was doing. B2, you’re misreading. I’m not “snarking” against IT, I’m snarking against me. I don’t think it’s possible to snark (I really don’t know what that word exactly means) against something you don’t understand. Perhaps if I’d spent more time paying attention in Mr. Green’s science glass in the 7th grade and less time paying attention to Joan Buttafucco…. >>Perhaps if I’d spent more time paying attention in Mr. Green’s science glass in the 7th grade and less time paying attention to Jo[ey] Buttafucco…. If you actually learned enough from one year of Mr. Green to understand this stuff enough to not, well, say you don’t understand it, I assure you Both Mr Green and you would be a lot more famous than Joey B now. And, might I add, for totally different reasons. I got a superpartner. It’s a ten foot rabbit named Harvey.